I need some rules to follow while flatting. I think I'm on the right track. I am not married to any part of this process, just wanted to try and figure it out myself before asking for help. So suggestions are more than welcome. Also, I made it this far from lots of helpful posts from the previous Manga studio Forum. Is it OK for me to link to those helpful links? Like garram tips on using the line correction tool and such? Set INK layer to multiply and make it the reference layer. Select the white in the INK layer. Color margin set to 45 to pick up the aliased looking grays from my dip pen (it inks a bit dry so some lines are a bit gray when drawn quickly). Select the FLAT layer and fill selection made from the ink layer with a solid color. Lock transparent pixel on FLAT layer. On the FLAT layer, fill areas that can be filled with bucket. Settings: Follow adjacent pixel/on, close gap/off, area scaling/off, multiple referring/reference layer on. For areas that the bucket can not fill due to hatching and what not. Make a new layer on top of FLAT and under INK layers. Trace the area where it touches another area with the same color. If a border area is already a different color, just make sure to encompass the current coloring area. Fill the area with the same flat color you made the outline with. On the FLAT layer, select the colors that got overlapped, and the area with no pixles. Make sure to use a selection tool with Follow adjacent pixel off, color margin set to zero. I keep a tab of tools for flatting, so I do not have change the settings on a tool. Just select the one labled for that part of the process (most people probably do this already). With the selection made, go back to the layer above the FLAT layer, delete, merge down. If done correctly, the area should be filled without overlapping any other area or the locked pixel area. 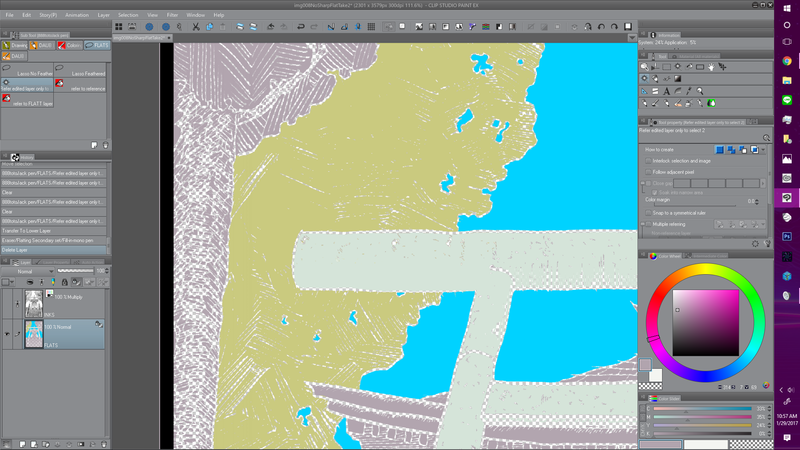 After all the areas are filled, turn off lock transparent pixels on the FLAT layer and use the correct line width tool to evenly fill in under the line art to complete the FLAT layer. The one thing I would suggest you change is to always flat using a monochrome line art layer. Why struggle working around anti-alias pixels? If you wanted to keep the anti-aliased line art in your finished artwork, you can always do that later by changing the line art back to a grey color expression. But to flat - use a hard edged line. The line art can stay in a folder if you have multiple layers, and set the folder to monochrome while flatting. When you do your final rendering, switch the expression to grey if you want. If you\re using a scanned art file and there are greys in your line, you can play with the alpha and threshold sliders in the monochrome palette to make them solid black while you flat. Ah, good idea. This will clean up the area fill areas where there was still a touch of color stuck under a grayish pixel. I didn't notice those till this morning. 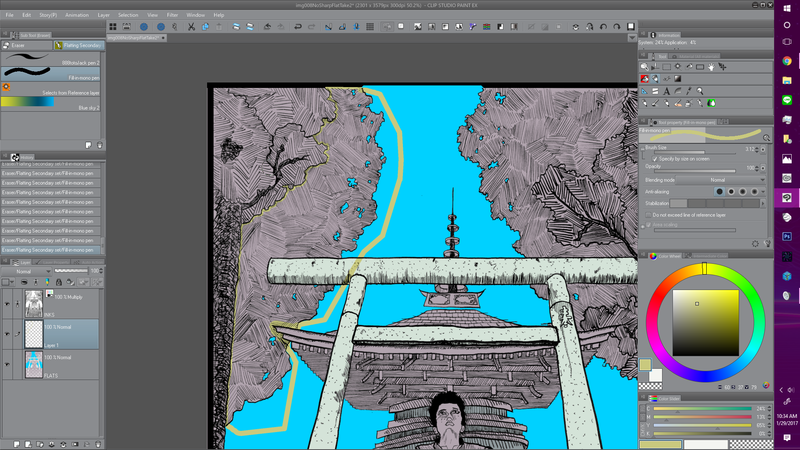 Under LAYER PROPERTIES changed expression color from COLOR to MONOCHROME. *Not sure what alpha does, it does not seem to change anything in my image. *Color threshold seems to be deciding at what percentage of gray should flip to black or white. Just realized that setting this too low makes it hard to fill in areas because they lines get small breaks allowing fills to bleed into unintended areas. And when it is adjusted you have to hit APPLY EXPRESSION COLOR OF PREVIEW for it to take effect. You're working with a scanned image I'm guessing, and setting it to Multiply Mode. Multiply Mode is old school Photoshop and it allows you to "see" below the line art layer as you color (leaving the white pixels intact). In CSP, you can hide the white pixels and color with your line art layer set to Normal. You can also set the opacity by the brightness of your image (under Edit). When you do this, the alpha slider will turn semi transparent pixels solid black or fully transparent. To hide the white pixels, when you switch to Gray or Monochrome, click the black box (you will see a black and white box on the right side of the palette). Yup. Scanned image, with the layer set to MULTIPLY. So, the with the lined art layer set to NORMAL, the expression color has to be set to GRAY or MONOCHROME to get the change expression color options? Or set the line art layer, with expression color set to COLOR, and go to edit to set brightness to opacity. Any advantages or differences between MULITIPLY and the other options? I only see the ALPHA slider if MONOCHROME is selected. But I lose the gray gradations if I choose MONOCHROME. *I just figured out that when using the bucket tool, you can click and drag to fill lots of little areas. For example here in the light gray area, I just filled the first rectangle, and while keeping the right click held down, drug the bucket across the other rectangles filling them all as I go. Way faster then clicking in each space one at a time. Can't believe I never tried that till now. You would only need to use Monochrome while flatting. Your flats should have hard edges. When you're done your flatting you can always switch back to gray. There's a lot of similarities between using Multiply Mode and using an expression that removes the white pixels but when exporting your line art, having the line art on a transparent layer is useful for putting your work together for printing. If you export the line art with white pixels you would have to set the layer to Multiply or Darken in your page layout software and the line art and color art will flatten at one resolution. If the layer is just black pixels and transparency, you can print your line art at a higher resolution setting the black to overprint. @boscoe Can you be more specific? AFAIK The DC flatting method is (in photoshop) pretty similar. Using a pencil to outline the area and then fill. The Michael K. Russel method is to lasso (in photoshop) everything and fill. Filling with the bucket in CSP seems pretty simple till there is a ton of hatching. Then outlining or clicking with the bucket and dragging across the hatched areas seems easy enough. Is there something I am missing? I know there is a plug in for photoshop that automatically fills in all the areas with different colors, but with hatching I think it would be a bit of a nightmare. Never tried it though. I think it was like 5$? 2: Use tools without any anti-aliasing. CSP allows you to turn off anti-aliasing for almost all of your paint tools. Select your line art layer. If you use the same names for your layers and layer folders (i.e, Lettering, Line Art, Color, Flats) the action will record the layer selection. If you don't name your layers and folders consistently you might have a harder time making this action. Be sure to have your line art set to monochrome. Selection>Color Gamut. Use Selected Layer and click on the black. Select your Flats layer and click Clear then Deselect. Go to Filter>Correct Drawing Line>Correct Line Width and crank up the slider. You need to fill you gutter space with white on your flats layer to do this. Click OK. Create a new raster layer and name it Under Printing. Selection>Reselect. Shrink the selection 1px for every 100 px of resolution (if you're working at 300ppi, then you would shrink your selection 3 px. If you're working at 600ppi, shrink your selection 6px). Then go to Edit>Advanced Fill. Use Specified Color and choose Red 128, Green 141. Blue 146. and fill. Deselect. And end the recording. 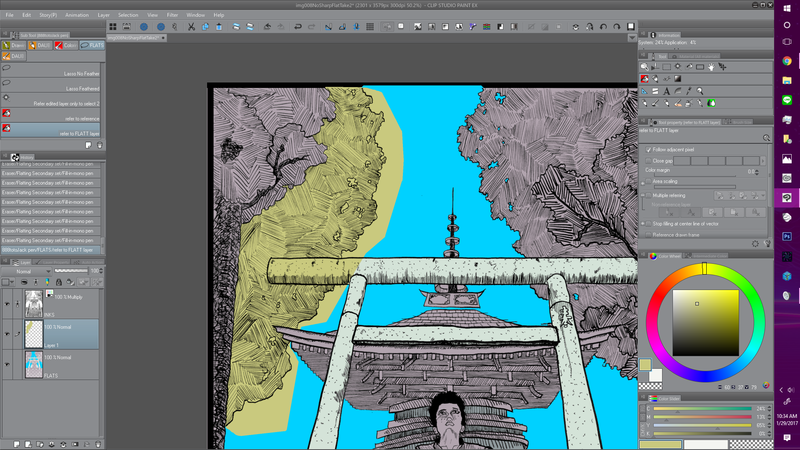 You would color on a layer below the under printing using the trapped flats as a reference. I do something similar to trap lettering art work which eliminates the need for working in vectors. @garlam This is great info, though I don't understand why you bother with clearing the line art from the flats layer. Your underprint layer should be all you need. There should be ZERO transparent pixels on your flats layer. You're coloring under the lines, not around them. @michaelsammler From what I'm reading here, you're scanning traditional inks on paper? What's important for saving time and effort is to scan them in bitmap mode, at the exact resolution they'll be pasted into your digital artwork. Just black and white, no greys. Like Garlam pointed out, your inks should have NO antialiasing. They may look jaggy and crappy if you zoom in on it, but that gets smoothed out during printing (or when you shrink it down for web use). The reason this is important is because any anti-aliasing on your linework will result in them appearing soft and blurry when printed and the greys muddy the colors where they overlap, or result in a crispy light nimbus around your lines if they don't overlap. Then it is an easy matter to use the Selection/COlor gamut to select all the white pixels and clear them so you only have black and transparent pixels in your inks layer. The side benefit of this is that now it is SUPER easy to get a PERFECT selection that only includes your ink lines and nothing else, no matter how much hatching you've done. :) Having this selection easily available is especially vital if you intend on doing any color holds on your line art. Use that selection as Garlam said: shrink it by a few pixels and on a new raster layer below the ink layer, fill it with that grey tone to provide underprinting for your linework. This keeps your blacks rich and saturated and helps avoid issues if there are slight color misalignments in printing. So, you should end up with a monotone black/transparent inks layer, an underprint layer, the layer you'll do you actual coloring on, and your flats layer, in that order. Nothing should be set to multiply or anything other than normal options. AT this point some philosophy comes into play. 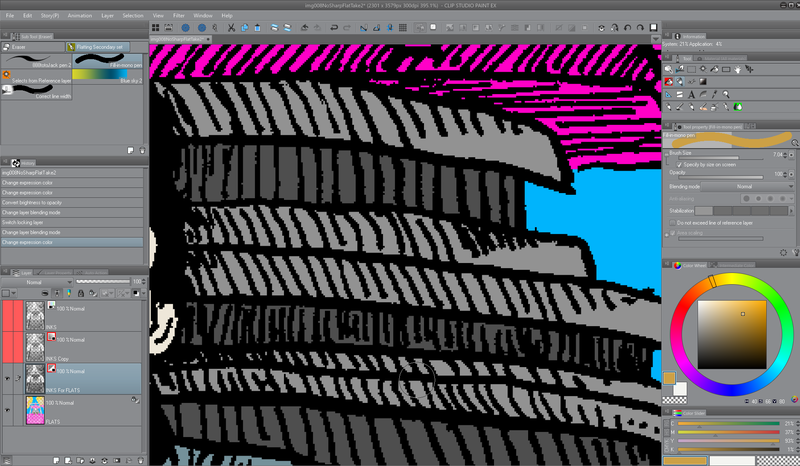 The book I linked to suggests that flatting should not really be considered part of the coloring process. The idea is to not waste time and energy trying to pick the "right" colors when you are flatting, the purpose of flatting is to A: make sure every pixel is covered and B: to create an easy way of selecting the individual elements in the art so you can render them. Though, if you know in advance what the colors will be, there's no reason why you can't use the middle value of each color when filling in your flats selections. It's just considered a waste of time if you're flatting for someone else to color or if you're going to require trial and error in figuring out the final color scheme. flood fill the whole layer with a color. Any color. Using the lasso tool (set to not anti-alias) select each panel and give it a unique color. Go into each panel with the lasso tool and starting from back to front (thinking of it like it's 3d) select each major element and give it a unique color, though for items that repeat throughout the page like a character's hair/skin/clothes it's a good idea to use the same color for things that will be the same color in the finished piece, so that it's easy to select them all at once, to speed up rendering and making changes. finally, do the same thing for the caption boxes and dialog balloons if they exist on the ink layer as part of the art. AT this point, the book says to make a copy of the flats layer, convert it to greyscale and make a channel out of it (they're using photoshop) you use this to make selections from using the magic wand set to non-alias. I don't bother with this layer conversion, I just use the flats layer to select from. But if you do it the way I do, once the flats layer is complete you should lock it and not touch it again. Do your coloring on a layer above. You need your flats layer to make selections from. @boscoe I'll flat without having to worry about area scaling or accidentally filling under the line. The paint bucket now has the option to prevent filling under black which is super nice but I still like to be sure. By clearing the line art, the Correct Line Width Thicken will spread the colors evenly until they meet at the center of your line work; if there's any color already under the line the spread is off a little. Some thinner lines might not have any underprinting (6 - 8 px) but you're right that the underprinting does a lot to clean things up.